I attended the Virginia Association of School Librarians (VAASL) conference on Saturday November 4th. I attended the author breakfast as the first session within this day. The authors in attendance on this day included Meg Madina, Ruta Sepetys, Madelyn Rosenberg, Wendy Shang, and Lamar Giles. I was lucky enough to be seated next to Madelyn Rosenberg so we had a chance to talk about her book “This Is Just A Test”. The author book talk on Saturday morning was especially interesting to me since it covered the topic of diversity and diverse characters from different walks of life, parts of the world, and ethnic backgrounds in books. 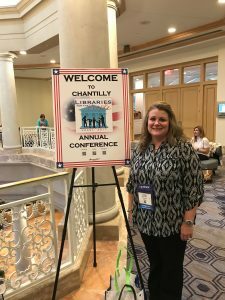 In addition to the author book talk, I also had a chance to converse with different librarians from around Virginia and learn about how they conducted different mini lessons within their libraries. 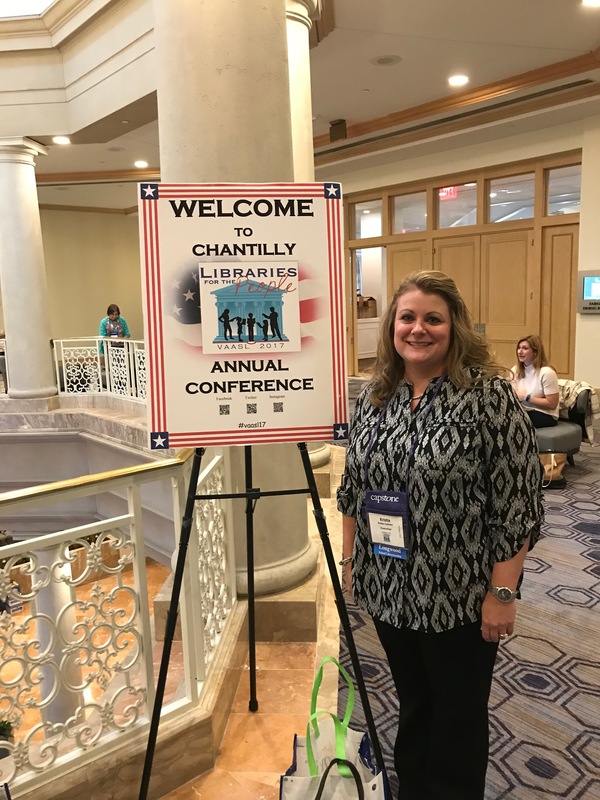 This was a great opportunity to not only meet and connect with other librarians but to hear about their different experiences in order to help me to shape my first year as a school librarian. 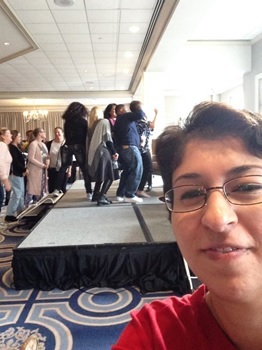 Additionally, I had a chance to attend a few workshops. One of the workshops was in regards to new technologies which included things from presentations tools, tools to use to create stations (such as QR codes), and technologies that help students to take ideas from a lesson and to place them in chronological order. I had such a great time; what an awesome conference!!! The 2017 Annual VAASL conference was an amazing experience on every level. The Marriott Hotel in Chantilly, VA, was beautiful, and the staff of friendly and helpful. On Saturday I attended the Author Panel Breakfast and two sessions. At the breakfast, the authors spoke about how their books encompass the idea of multiculturalism. Meg Medina was the moderator for the event. The authors, Lamar Giles, Wendy Wan-Long Shang, Madelyn Rosenberg, and Ruta Sepetys, talked about their ideas and views on multiculturalism, their books, and their writing styles. The first session I attended was “Reading Love, A Year of Collaboration”. The session was phenomenal. The presenters Tonya Dagstani and Nathalia Hardy presented information about the collaboration between the librarian and English teacher. They used the book by Penny Kittle, Book Love, to develop their collaboration. In their collaboration lesson, they used different sections of the book like reading ladders, speed dating, conferencing, thematic composition books, and many others to show the ways the library and the classroom can work together. The second session “Keeping Up With Technology” was innovative and informative. I value myself as technology savvy and this session brought new ideas how to use technology in the classroom and library. I thought Rebekah Hall did a wonderful job showing the different ideas and providing how they could be used in different classes, not just English, but science, world language, etc. I provided the link to presentation since so many great ideas were given: https://www.emaze.com/@AORLOCRZQ/keeping-up-w-technology. Throughout the day, I felt as if I were in my element. Surrounded by librarians, future librarians, teachers, and authors, I was able to learn so much about being a librarian.